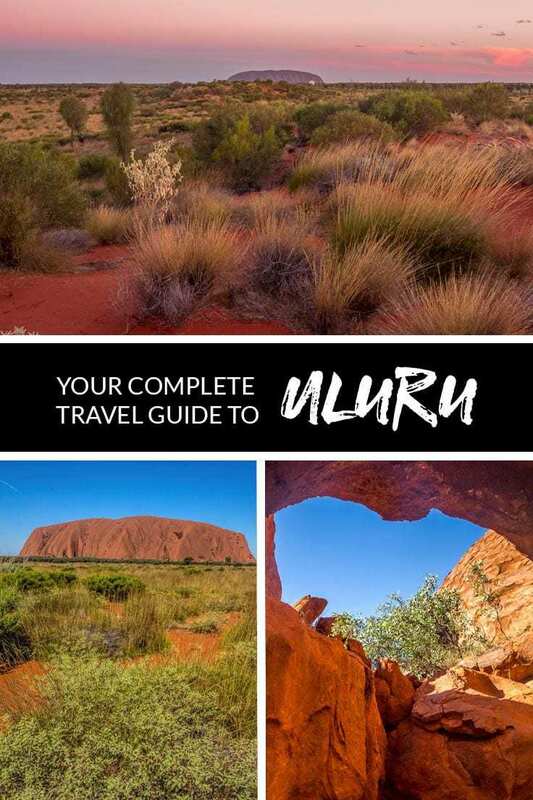 In this Uluru travel guide we explore this unique spot in the centre of Australia. The park is recognised as a UNESCO World Heritage area and we’ll show you the many and diverse ways to experience it. 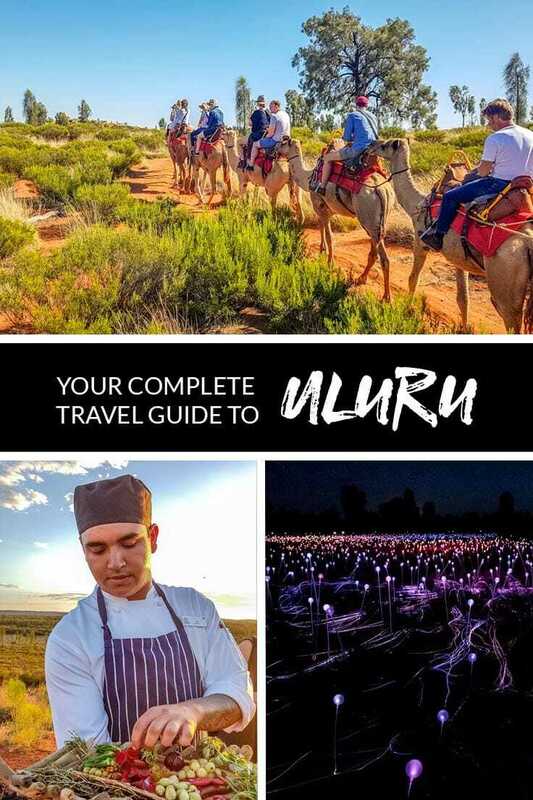 From things to do in Uluru to fabulous indigenous foodie experiences, a diverse range of accommodation and fun adventures to suit every budget and occasion. The Uluru – Kata Tjuta National Park is located near the center of Australia in the south of the Northern Territory. It’s a region of dramatic arid desert landscapes, red earth and geological wonders. Uluru itself (previously known as Ayers Rock) is a monolithic rock formation standing 348 meters high and 10 kilometers in circumference. It’s one of the few dual listed UNESCO World Heritage sites in the world recognizing not only it’s unique geological formations but also the unique culture of the region. The red centre, Uluru in particular, had been on my bucket list for so many years that as I flew out of Sydney towards the centre of Australia I started to wonder if it was possible that it wouldn’t live up to my expectations. Had I built it up too much in my head? Could it really be as exhilarating and emotive seeing it in real life as what I had imagined? I’d have to say it was everything I had hoped and although I had a very full 2 day / 2 night itinerary there is still plenty I will be going back for. It’s easier to get to Uluru (Ayers Rock) Airport than I thought. I flew with Jetstar Australia who offer daily flights for Sydney and 5 flights a week for Melbourne. For other cities there are multi-city flight options through these hubs. The Uluru (Ayers Rock) Airport is 10 minute drive from the resort and transfer services are available. You can also hire a car from the airport, three rental car companies operate from here but with limited vehicles available it’s worth booking ahead to get what you want. Although you’re in the desert you won’t necessarily need to rent a 4 wheel drive vehicle for Uluru travel. The highway in and out, the roads into Uluru – Kata Tjuta National Park to all the viewing platforms and major walking tracks are all sealed and good quality roads, for many visitors a sedan will be a comfortable and cheaper alternative. There is one main place to stay near Uluru and that’s the Ayers Rock Resort. This isn’t a resort complex in the usual sense, more of a small town. There are 5 accommodation options to suit all needs and budgets from the 5-star Sails in the Desert where we were based, to the campground with various hotel, lodge and self contained apartment options in between. In the centre of the complex is the town square, a facility for all guests and those that live and work in the area with essential services such as a bank, Post Office, Newsagent, Petrol station and IGA convenience store. There’s also a gallery and gift shop here. An average stay for visitors to Uluru is 2-3 nights but if you have an interest in hiking, wildlife or Australian heritage then you might want to allow a little longer. When in a truly extraordinary place like this you plan to do things that are a little out of the ordinary, here are 14 Uluru experiences that are worth your consideration in this beautiful and unique destination. Sunrise at Uluru viewed from the dune behind the Field of Lights. There is no better way to start they day than to witness the sunrise. At Uluru it is an experience that takes you from true darkness lit only by the distant stars, through to first light as it peeps out from below the horizon. Your surroundings slowly start to come into focus as the colours of the sky change the hue of the landscape and finally it’s golden hour, so loved by photographers and those who don’t mind getting up in time to enjoy it. Even if you generally prefer to sleep late you’ll want to see this at least once. 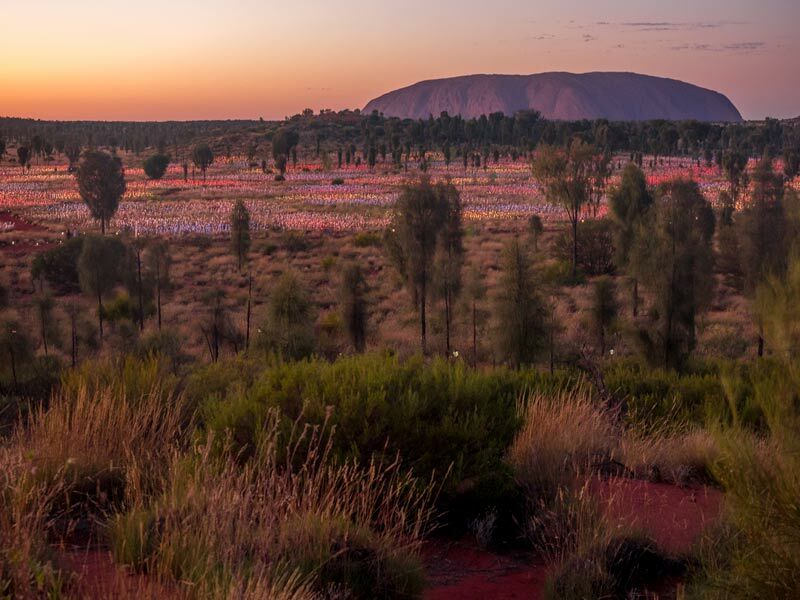 Having seen the sun come up over the desert something you surely will not want to miss is seeing it set with the reflected colour of the sky creating a dramatic backdrop to Uluru and the desert surrounding it. There are many spots and option for watching the sunrise or sunset. Various tours encompass the experience from public or private vantage spots. 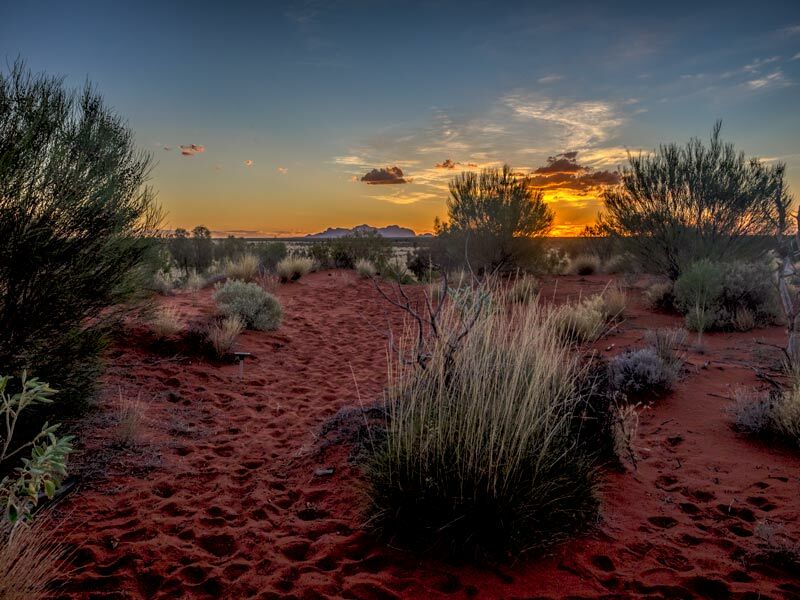 Within the National Park there are dedicated car parks with viewing areas and within the Ayers Rock Resort itself you can talk a walk up one of the dunes for a more distant view out across the desert to Uluru. The base walk of Uluru would be hard to resist if you’re up to the 10 km flat walk. During the summer it can be very hot out here so make sure you start early, wear sunscreen, a hat and bring plenty of water. The track is packed gravel so easier walking that I had anticipated on the desert sand. This is the best way to see it up close from all angles with the different lights, markings and exploring the gorges. The ring road is quite a distance from Uluru itself in most parts so while you get a great perspective and photos from back there it’s definitely worth getting up close on foot too. If the full walk isn’t possible there are a series of car parks and you can instead walk shorter sections from those. 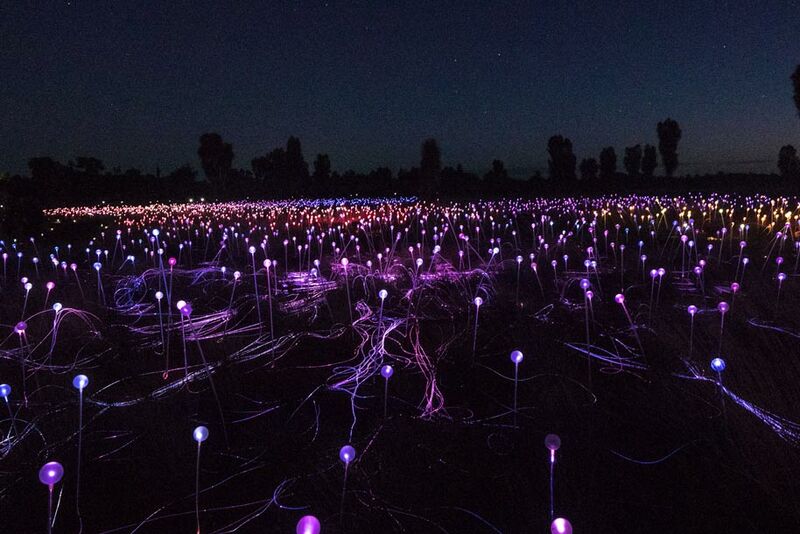 The Field of Lights is an art installation envisaged and created by British artist Bruce Munro. He spent 8 years in Australia earlier in his life and when he left his sketchbook held the early inspiration for this desert creation. It was always intended to be an ephemeral piece and was due to be closed permanently in March 2018, just days after our visit, but has now been extended to December 2020. When you visit to be sure to walk right through paths within the field to appreciate how vast and impressive it is with lights running as far as you can see into the distance in all directions. Then before the sun rises head up the sand dune to the upper viewing area, the expanse of the lights can be fully appreciated from up here and it’s a fabulous sunrise viewing spot. As darkness gives way to light you’ll see Uluru appear in the distance behind the lights before they are turned off and disappear. If it suits your itinerary better you can also do the reverse experience during sunset or visit after dark. Sounds of silence has been running at Uluru for 25 years, I was fortunate to be here for the gala dinner and launch of the new 2018 season menu. The region has increasingly positioned itself as the bush tucker capital of Australia and this focus on native Australian flavours in a modern interpretation throughout it restaurants and food experiences and is extremely popular with the mixed Australian and international audience. The evening starts with a short walk up the sand dune to the welcome area where live music is playing. The view is stunning and it’s hard to know where to look first. To the left is Uluru with a soft pink halo of reflected light starting to form around it, to the right is the setting sun and Kata Tjuta (previously known as the Olgas) with a massive and seemingly flat expense of desert in between. Sip on bubbles and get your first taste of the bush tucker inspired canapes up here. As the sun sets you are led down to the dining area and seated in tables of 8 to enjoy your meal. Our gala dishes were inspired from the new menu and featured heavily in culinary creativity and native ingredients. Even the desert which was a work of art was created around Australian ingredients including desert lime presented as a cheese cake that perfectly straddled the line between sweet and tart and the most intriguing and delicate rosella glass. During dinner we are treated to more music and later as the lights are put out the milky way appears in even greater definition as we are engrossed in a talk about the night sky incorporating both western and indiginous knowledge. To many visitors it’s a surprise that the Australian outback has the largest and healthiest wild camel herd in the world. These animals were introduced to Australia as working animals in the 19th century and have thrived in the environment, perhaps a little too much. The camels at Uluru Camel Tours have come from the wild herd and are beautiful examples. My companion for the morning, Sturlo, was gorgeous and good-natured with the most fluttery lashes. It was a surprisingly comfortable ride and the only time you don’t feel quite as secure up there is when he stands up or kneels down for you to get on and off. There are a range of tours you can do including a dawn and sunset option. There are many lookouts in the region that give a great perspective on Uluru. Some are from a closer vantage point within the National Park while others are further back. Most of these take advantage of the many sand dunes in the area and within the Ayers Rock Resort there are a couple you can climb for a view, just ask the staff to point you in the right direction. One of the unique things about Uluru is that the colour appears to change constantly throughout the day with the light levels, shadows and distance, from a brilliant ochre red to a dull taupe. 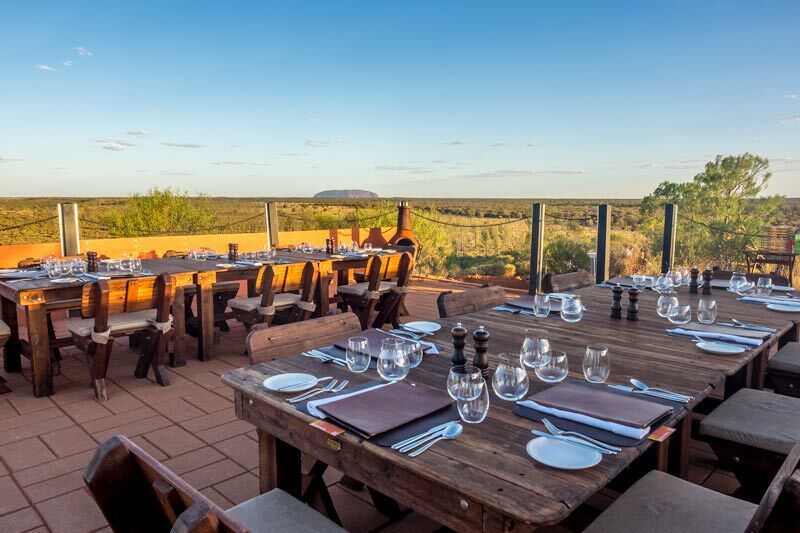 The Ayers Rock Resort culinary team, under the lead of Executive Chef Vanessa Grace, brings Australian native flavors and ingredients to the menu and has introduced a range of culinary experiences to the itinerary. The team have put Uluru firmly on the map as the bush tucker capital of Australia. 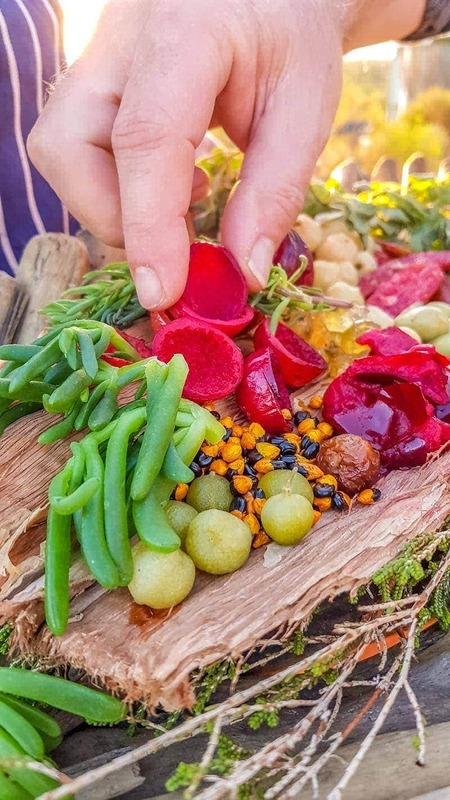 In addition to trying dishes incorporating indigenous ingredients in the restaurants, Tali Wiru and Sounds of Silence there are other options including an introduction to the ingredients at the bush food experience in the Wintjiri Arts and Museum and garden walks highlighting bush foods and medicines. The cultural centrer is a good place to start your visit to Uluru, especially if you aren’t on an organised tour. Open from 7 am until 6 pm it provides information on the landscape and culture of the region. There’s a cafe here and you can join daily ranger guided walks, learn about birds and wildlife in the region and get information on the walking tracks. In the desert, especially in the summer it can be unbelievably hot through the middle of the day. It’s recommended to schedule your walks and activities early in the morning or later in the afternoon as the sun sets. During the middle of the day most people will make the most of the facilities and options around the resorts. The pool or lounger on your deck or in the shade of a tree will always be a good choice after a long leisurely lunch but there are galleries and activities scheduled in the resort if you are looking for something different. Note that swimming in water holes within the National Park is not permitted and there is very little natural shade. If you don’t have your own transport and want to explore independently the Uluru hop on hop off shuttle offers that option with 1,2 or 3 day ticket options. 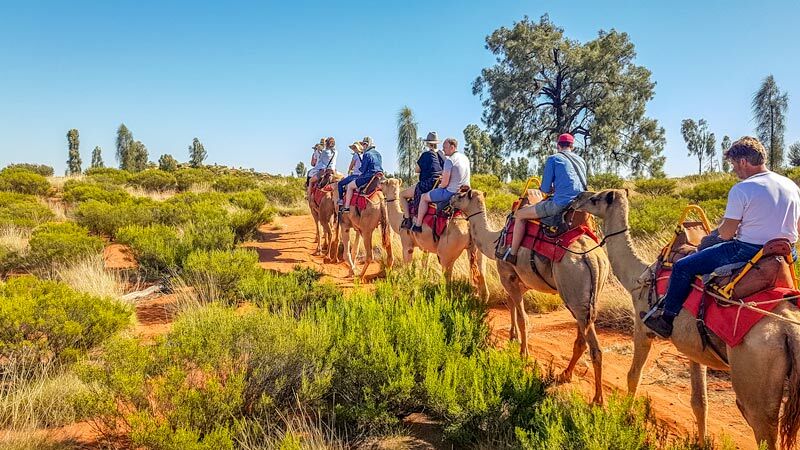 There are stops at the hotels, campground, sunrise and sunset lookouts, cultural centre and entry points to the walking tracks at both Uluru and Kata Tjuta. You can just see Kata Tjuta in the distance here as the sun sets. I didn’t get out there this visit but it is something I will be back for. Start at the dune viewing area for a wider context of the area then make your way into the walking tracks. The Walpa Gorge Walk is a grade 3 and should take around an hour while the Valley of the Winds has a series of walking tracks at grade 3 & 4. The Karu Lookout is the least challenging of these but even so make sure you are prepared with a supply of water and sturdy shoes. The premium dining experience in Uluru is at Tali Wiru but an evening here is more than just dinner. 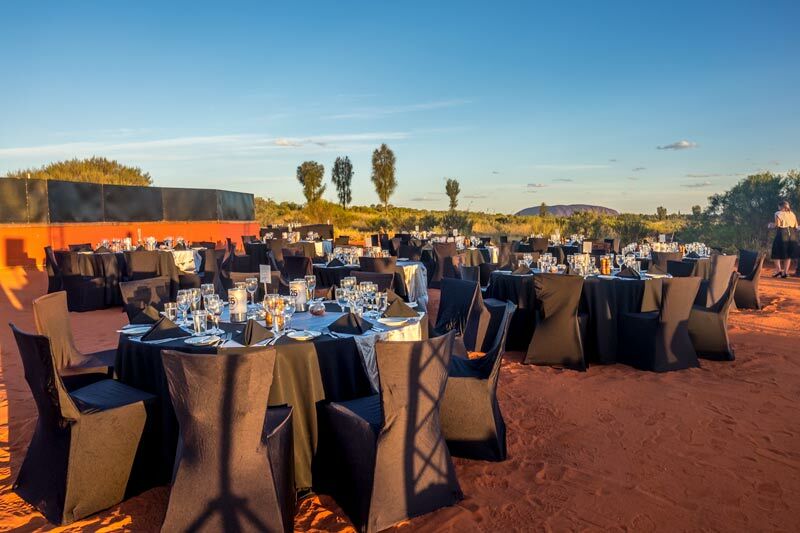 With no more than 20 guests you are driven into the desert to a private sand dune with expansive views out to Uluru in one direction and Kata Tjuta in another. You arrive ahead of sunset and as your transport pulls up you hear the sounds of the didgeridoo welcoming you as you walk up the hill. You’ll feast on delicious canapes featuring indigenous ingredients which appear thoughtfully throughout the full menu. As the sun goes down you are taken up to the higher level of the dune to be seated for dinner. The menu is matched with wine throughout and perfectly executed under the skilled oversight of executive chef Vanessa Grace. There’s an entertaining astrology talk about the night sky that’s dramatically visible out here with no light pollution and after dessert has been completed you are welcomed back to the fire pit to learn a little of the local culture and enjoy a hot chocolate or cognac before the trip back to the hotel. Starting before dawn you are whisked away in a very comfortable 4-wheel drive vehicle to a private sand dune to watch the sunrise over Uluru. It’s a smaller group tour enabling you to enjoy the peace of that hour of the morning and hear the bird song in the grass and trees around you. Breakfast consists of hot bacon and egg rolls, fruit, pastries and a selection of hot and cold drinks. From here you head into the National Park and get up close to the Rock. There’s some walking involved but it’s flat even ground and you don’t walk far. Our first stop next to Uluru is the meeting place for the free morning ranger guided walk near the start of the climb. We walk around here for a while and take some photos then continue on to Mutitjula waterhole, our second stop for the morning. Our guide for the day is Toby who is entertaining and knowledgeable sharing insights into the geology and cultural significance of Uluru. There are 178 species of birds recorded in the National Park but I’m happy to add the striking blue splendid fairy wren flitting in and out of the mulga to my life list. I’m also interested to learn the Anangu story about the common but cute Willie Wagtails with their sweet song. The local people call them the gossip bird and children are taught to lower their voice when they are around lest their secrets become known. Located in the middle of the desert you might expect food choices to be limited, however my experience was quite the opposite. The restaurants and foodie experiences within the Ayers Rock Resort are exceptional and their use of indigenous ingredients and unique Australian flavors is dramatically changing perceptions along the way. 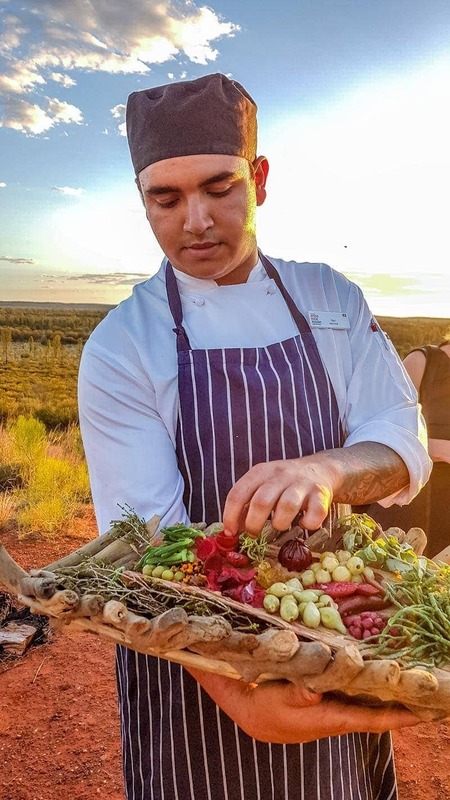 Ayers Rock Resort differentiates themselves through indigenous Australian ingredients and talented innovative chefs who invest the time to source the best ingredients and discover how to bring out the characteristics of each. From unique greens such as saltbush and fruits including Davidson plum and rosella to protein sources including wallaby, crocodile and green ants. While taking some down time I’d also highly recommend trying out a custom resort cocktail such as the Red Rock Negroni, a gin based cocktail featuring local desert fruits and herbs, both refreshing and delicious. The peak season for visiting Uluru is the cooler seasons from April until September. At this time the day’s are mostly sunny and temperatures pleasant for being outdoors but you’ll want something warm to wear once the sun goes down. Through the middle of the year it gets close to zero overnight but it makes for easier walking during the day if you are planning some of the longer tracks. In late March the daytime highs were up around 36 Celsius but it’s a dry heat and even out on the dunes in the evening I was comfortable in a summer dress. You can check average temperatures here, it’s well worth doing to make sure you have comfortable gear to fully enjoy your desert stay at any time of year. 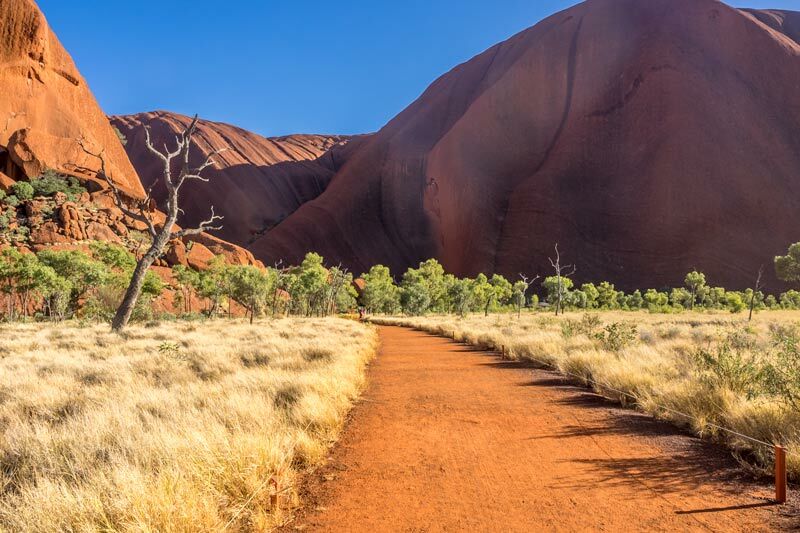 If you are going to see the best of Uluru and the National Park while you are here you’ll likely be doing a bit of walking off the sealed path. The tracks around Uluru are very good, they are smooth graded and formed from fine gravel sand. Sturdy walking shoes are required for all tracks. To protect yourself from the harsh Australian sun remember to pack a high protection sunscreen for face and body. I’ve written before about the best sunscreens for travel, take a look for some of our latest suggestions if you are avoiding using your current one because it’s sticky, shiny or uncomfortable. A sunhat is essential and keeping covered up or in the shade when you can is advised. During the day the dress standard around the resort area is casual. If you’re doing the walking tracks or exploring in the National Park you will want enclosed walking shoes and comfortable clothing. In the evening dress is smart casual for dinner and evening events. The desert temperature can vary widely, getting cool to cold after the sun sets so take something warmer with you if heading out for one of the dinner events or evening tours. You can purchase bottled water in the resort and the tap water can be safely drunk. I always carry a refillable water bottle when I travel, it helps the environment by not having to constantly dispose of plastic and it’s also a lot more sturdy, avoiding bottles splitting or spilling in my bag. It is clearly marked within the park areas where photography is not allowed, these are culturally sensitive areas to the Anangu people. At some of the lookouts there are times of the day when photography is allowed and others when it is not, this is because the light and shadow reveals and conceals aspects of the rock face at those times. Photography and filming permits together with individual approval of images are required if photography is for commercial or editorial use. 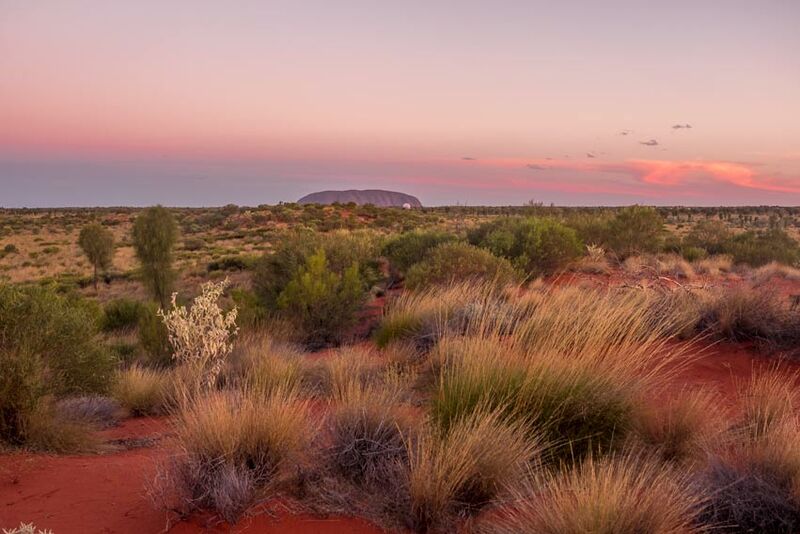 Be aware that you need to purchase a pass at the entry gate to gain access to the Uluru – Kata Tjuta National Park. The cost is $25 for a 3 days adult pass and allows unlimited entries and exits over that period during the opening hours. There are annual passes and discounts for children or families available. The National Park is open 365 days a year although opening and closing hours vary by month as set out below. The timing allows time to get set up to view sunrise and sunset, begin walks at first light in the hotter parts of the year and observe the night sky without light pollution. Entry and exit is only via the checkpoint so ensure you are through by closing time. The red sand contains a significant portion of iron that is oxidized giving the distinctive ochre red color. In the predominantly dry climate that fine dirt becomes quite dusty and when the breeze gets up it can blow around sticking to everything. It does brush or wipe off fairly well but I’d suggest not wearing delicate or light coloured shoes or clothes that can’t be cleaned easily. I found everything washed up well either with a damp cloth and elbow grease or a bit of Napisan. Cultural sensitivity. The UNESCO World Heritage listing for the regions cultural landscape recognizes the traditional belief system of one of the oldest human societies on the planet. Part of this belief system is that Uluru is a sacred place, it is honored and respected, much as some other cultures might look upon an ancient temple or artifact. Indigenous Australians don’t climb Uluru and they ask that you don’t either. 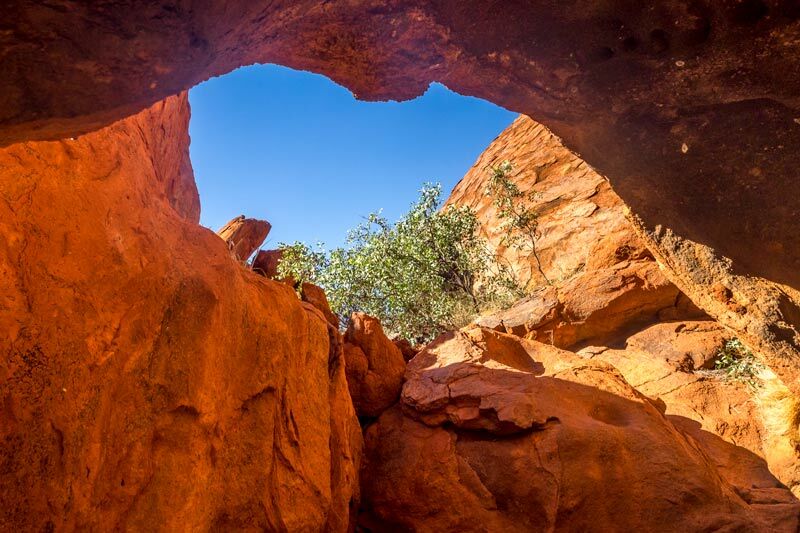 Part of the reason is that the climb allows a view into sacred places below that are only known and should only be seen by certain members of the Anangu community. Safety. The second reason is your personal safety and the safety of others should a rescue be necessary. It is an extremely strenuous and difficult climb, many people have suffered serious injury, heart attack or death as a direct result of climbing Uluru. Environmental considerations. Climbers have not respected the basic tenets of protecting nature and the environment on Uluru. All manner of rubbish from bottles to batteries, soiled nappies and human waste have been left behind on the sacred rock. The remnants of this washes down the rock face polluting water holes and the environment below. A visit to Uluru in the Red Centre is an experience that most Australians plan at some time in their lives and for visitors to Australia it makes up the classic triangle of the Great Barrier Reef, Sydney and the outback. Please share your own Uluru experience in the comments below or if you have questions we’ll do our best to answer them for you. Thanks for sharing your ULURU travel guide, Toni. Surely Uluru is beautiful. I remembered when my first visit, I really felt the excitement and surely amazed. Pleasure to share this on my facebook page. Amazing post Toni! I’m travelling to Uluru soon so this is fantastic. Fabulous post Toni. The photos are fantastic and make me want to go to Uluru immediately. I especially like the Sunset with Kata Tjuta in the background. I shared this on my facebook page because and pinned it because I’m sure my readers will love it. Thanks Jan, I’ve wanted to go for so long, only problem with bucket list items is I don’t actually tick them off, I end up wanting to go back and see more.